Big day today, finally completed a project I’ve been working on for several months. This is actually a double benefit since not only can I set my sights on a new endeavor, there’s one more post topic in the hopper. Now only need to process the 20o pictures and get them ready for the blog .. don’t panic, probably won’t subject you to all of them … or maaaayybbee hehehe. Until then, figured I’d try to wrap up the Henderson Bird Viewing Preserve visit. Other photo shoots are starting to back up in the queue and need to get at least a few of them out of the way to make room for the new year. You may recall there was a post earlier in the month on the Great Egret (link here). 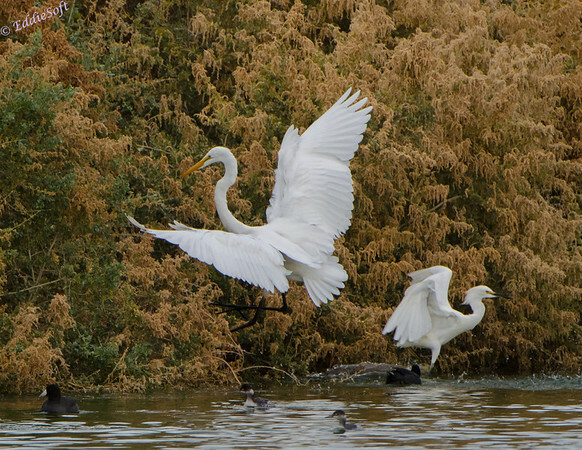 We were lucky enough to have multiple encounters with various Egrets and at one point they decided to put on a show! I really like this shot for a number of reasons. Clearly the birds themselves were captured in similarly unique poses which shows off how pretty these birds are. 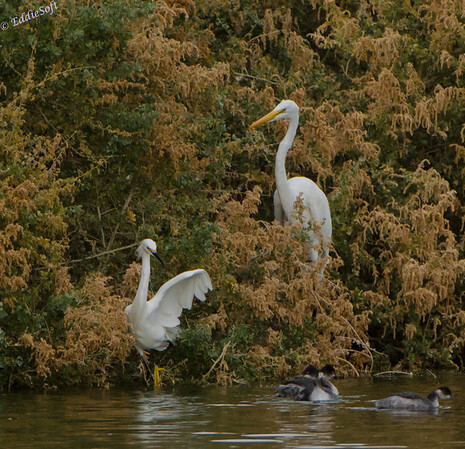 The large one is the Great Egret and based on what I can tell of the bill from this angle, the smaller one is a Little Egret – possibly Snowy but the neck seems a little long for that. They reminded me of Guardian Angels with their pure white wings raised up like that. After a little bit you tend to get curious and your eyes start to wander. Following the Little Egret you notice some Grebes passing by – wonder if the Egret was trying to scare them away from their feeding area. They were coasting by without alarm so doubt the Grebes cared much. Still searching you start looking at what has the Great Egret’s attention. That leads to the American Coot somewhat hidden in the dark colors. Turns out that Coot also has its wings out basically taunting them – I have already documented how those Coots like to mock their pond mates (link here). Some of you may have already seen this shot a little earlier – accidentally put it up on Birding Across America site (link here) before remembering it had not debuted here yet – oops. Not wanting to be left out, another Egret decided to join the festivities. 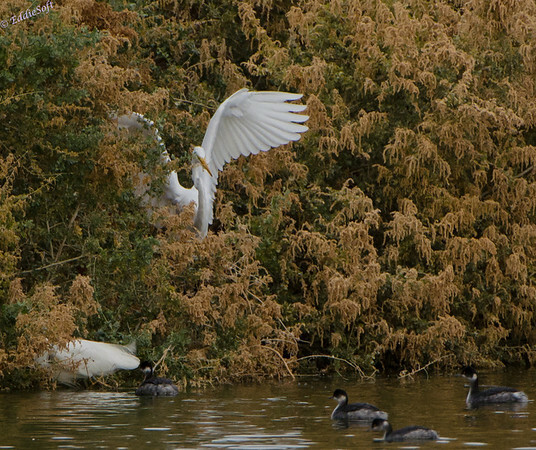 Can really see the span of those huge white wings on the Great Egret from this angle. 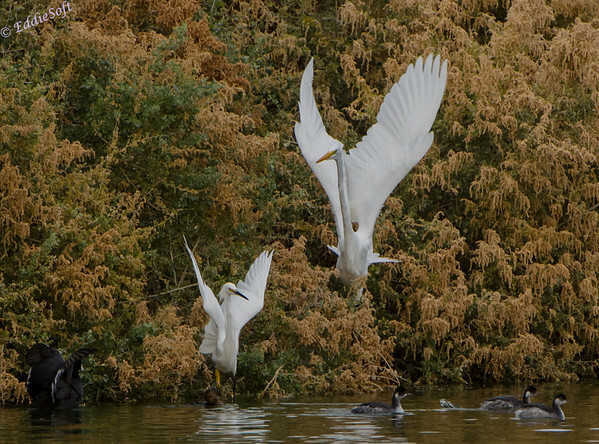 Hit the jump to learn why these Egrets were so annoyed! Overall, they were acting a little weird, almost agitated at something. Normally they do not get to concerned over the smaller water fowl due to their superior size – that bill makes for a formidable deterrent as well. Yet, they were hopping back and forth and flapping their wings randomly. This didn’t seem to deter the Grebes much – after paddling out a little ways they made their way back to the protected area. 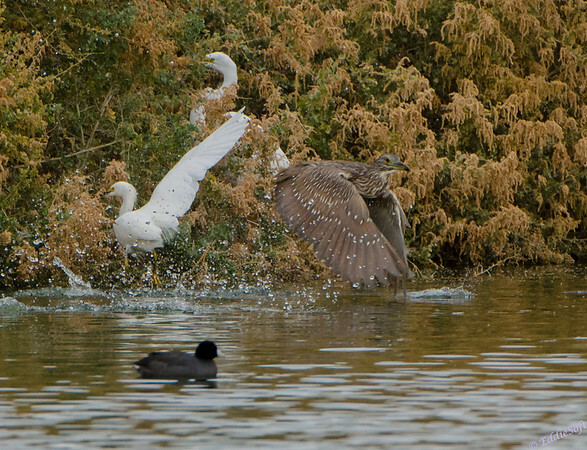 There’s actually one Grebe brave enough to sneak up behind the Egret that dared threaten them. This prompted the more forceful response from Great one. Something was still agitating them and based on their behavior it seemed to be coming from the bank and not the little guys on the water. Nothing obvious seemed to be prompting that attention but they started moving in on it. All of a sudden the reason became crystal clear. Remember that previous post where we discussed whether the bird being featured was a Bittern or a Juvi Night Heron (link here)? 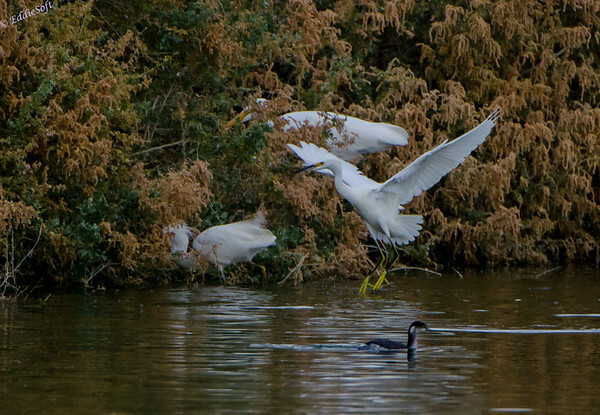 Truth is that Night Heron was actually hiding in the bank behind the Egrets. This was what was irking them – having another large bird lurking in the weeds. They eventually flushed it out and it totally caught me by surprise. As a result, I did not execute well on the shot (being startled is also my excuse for not getting very crisp shots on the previous post). The Heron hit the water with its wings on the way out causing the spray you see trailing it. They are a heavy bird and may have needed the extra time to get lift, but something tells me it just wanted to splash those Egrets as payback for disturbing his calm. You can see once again, that Coot wasn’t phased in the least – not sure if they are just stupid or overly confident. Think there is one more cleanup post from Henderson and we should be done! Happy birding everyone. This is a gorgeous post!! I was waiting for this post since I saw the first egret picture on the Birding Across America site and asked why I hadn’t seen it before. The entire sequence is awesome. I can’t believe you got that last shot with the Night Heron. There is no way I would have had the presence of mind to have taken that shot given the sudden appearance of the bird. Three in a row – careful, you are going to injure yourself if you are not careful! Yeah, I kinda accidentally let this serious out of the bag early – got caught up trying to support that sight and out ran my headlights thinking they’d already appeared on the blog (the official release location for my pictures). This was one of those series that I wasn’t sure how it was going to turn out – all that movement with brilliant white birds makes for some difficult manual focusing. There were plenty of screw ups in the set, but those ummm let’s just say they were deep sixed – thank god for the digital age. That Night Heron appearance definitely startled me, but having the crap scared out of you time and time again by angry Sandhill Cranes is good training to stay on focus in the midst of chaos. Linda still laughs every time she sees my pictures of the Crane legs (as in ONLY the Crane legs in the shot) the first time I encountered those neurotic birds. Beginning to miss Henderson already.. oh wait.. there’s another visit I still have not processed yet- YEAH!